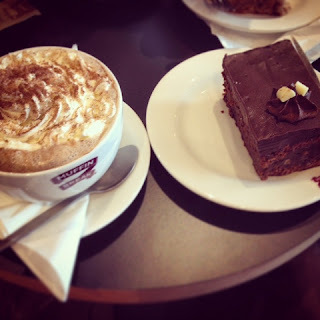 After spotting new coffee shop Muffin Break during our visit to town last week and being enticed by their display of huge slices of cakes, muffins, brownies and more as we walked past Mum and I decided that we needed to try it out ASAP. I'd not heard of Muffin Break before so I had a quick browse of their website and found out that they originated as a small shop in Canada before creating a franchise in Australia. Although they opened their first UK store way back in 2002 they have only opened just over 40 stores since! At first glance Muffin Break's menu seems much more simple than that of Costa or Starbucks offering coffee in Cappuccino, Latte, Mocha and Espresso varieties available in the incredibly easy to remember Small, Medium and Large sizes. The also provide tea, hot chocolate and a small range of cold drinks. I think this is a welcome change from the increasingly confusing drinks menus at rival stores. The snack selection is where it gets interesting as the range is pretty huge! The glass display counter at the front of the shop encloses a savoury selection of pasta bakes, wraps, panini, tarts and more, I'm not sure if they are made on site but they all looked fresh and delicious. The sweet selection looked positively mouth-watering. The cake slices and traybake bars looked giant and included coffee shop favourites carrot cake and chocolate brownie as well as some new exciting slices to try such as the Mars Bar slice. As well as all this there are also a whole range of muffins to try in a display behind the counter. Unfortunately I didn't notice the muffins until we had already paid so I missed out on my favourite variety - gingerbread! It was really difficult to decide what to order but in the end Mum chose a large latte and a slice of cake (I can't remember if it was carrot or coffee as it seemed to disappear before I had the chance to try some!!) while I chose a regular mocha topped with whipped cream and a chocolate brownie. My drink was chocolatey, with a great aromatic coffee taste and tasted amazing with the cream as I don't like a strong coffee flavour. The chocolate brownie was incredibly dense and rich because of the thick layer of chocolate topping, it was a bit too much for me so unfortunately I couldn't finish it. Chocolate overload! As I've already mentioned Mum ate her cake very quickly so I must assume that it was rather good! I loved the atmosphere of Muffin Break too. I think because the shop is new not many people have it on their coffee radar yet so it was pleasantly quiet with lots of places to sit, unlike Starbucks or Costa which are always packed to the brim. The decor had a rustic yet modern and laid back feel with lots of wood panelling and exposed light bulbs. It doesn't have cosy armchairs and sofas like Starbucks does, but I actually preferred the layout of the store. As we were paying we were offered a loyalty card which of course I accepted. Once I register the card I get my first drink for free and then every 6th drink after that. This seems like great value for money compared to the other coffee shop loyalty deals (Café Nero offers every 10th drink for free, while Costa offers 5 points (5p) on every £1 spent). Overall I was very impressed with Muffin Break. The prices seem reasonable, the cake and snack selection definitely trumped that of rival coffee shops, everything tasted good and I liked the decor and atmosphere. The loyalty offer definitely has me wanting to come back for my free drink and to try that gingerbread muffin! My only flaw is I can see it getting really busy toward Christmas as it is in the middle of a shopping centre, and that it is in the town centre and not around the corner from my flat like Costa is!